Tagged as the Queen of R&B, Kyla will mark her 15th anniversary in the music industry with a major concert titled Flying High. It will be held at the Kia Theater in Cubao on November 20. Incidentally, "On The Wings of Love" is the theme song of the ABS-CBN primetime teleserye of the same title, starring James Reid and Nadine Lustre. Kyla is grateful that her rendition is garnering positive feedback from listeners, particularly JaDine fans. “Sobrang happy ko kasi everyday meron akong nare-receive na messages about 'On The Wings of Love' [song]. “Isa kasi ako sa masugid na manonood ng On The Wings of Love teleserye. Does she plan to invite James and Nadine to watch her Flying High Concert? Kyla revealed that her guest performers will include Jay-R, Erik Santos, Angeline Quinto, and KZ Tandingan. As it is, Kyla and Jay-R have always been a tandem even when they were still with GMA-7. "I'm just really happy na kahit hanggang ngayon makakasama ko pa rin siya sa stage. "Si Jay-R alam naman nila na he's very talented. 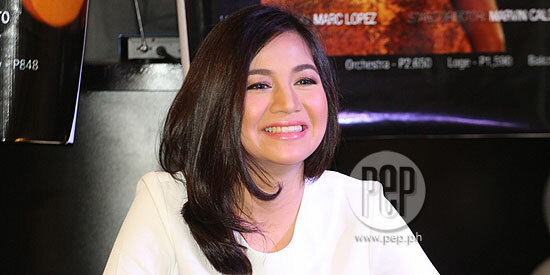 And yung genre niya is R&B, pareho kami, so I really wanted him to be in the concert." As for Erik, Kyla said that they've previously recorded two songs, but have yet to perform together in a live show. "Si Erik, first time ko siya makakasma live on stage. Alam naman natin kung gaano ka-powerful ang voice ni Erik. Masarap din makasama on stage and to have a duet with Erik Santos." CAREER HIGHLIGHTS. PEP.ph (Philippine Entertainment Portal) and other entertainment reporters were able to interview Kyla at her solo presscon held at Packo’s Restaurant in Quezon City, last Monday, September 7. Looking back at her singing career, she couldn’t help but reminisce how she used to sing in lounge bars during her college years. “Back then I’ve been doing jazz songs, standards, hindi masyado ng pop songs,” fondly recalled the 34-year-old performer. To date, she has nine studio albums and three compilation albums under her belt. Not to mention her recognitions from Myx Music Awards, MTV Philippines, and Awit Awards. When asked about her career highlights, the singer's top-of-mind answer was when her music video for "Hanggang Ngayon" won at the MTV Video Music Awards’ (VMA) in 2001. She also cited her first award as Best New Female Artist and Best Song in MTV Pilipinas Awards. But more than the recognitions, Kyla maintained that what matters is her passion for her craft is stronger than ever. “Kasi for me lahat ng ginagawa ko highlight [sa career ko]. I always do my best sa lahat ng ginagawa ko,” she mused. EMBARASSING MOMENTS. Along with her accomplishments, Kyla also recalled some of her most embarrassing moments as a singer. One memorable incident happened at a provincial show during her early years in the biz. “E, sa probinsiya wala namang ilaw-ilaw na bongga, usually yung dilaw na bumbilya tapos isa lang sa gitna. “E, umulan, so maraming gamu-gamo sa stage. Nagkumpulan sila sa ilaw. Kyla was rendered temporarily voiceless as she accidentally swallowed the moth. “Kinakanta ko pa yata ‘Didn’t We Almost Have It All’ ni Whitney Houston, so mataas na kanta. “Ang nagyari nalunok ko siya! Tapos pagkalunok ko sa kanya nawala yung boses ko. The R&B singer said that she was really embarrassed about not being able to finish her song number, bus she had no choice but to cut it short. “Tapos binigyan ako ng malamig na tubig na punong-puno ng yelo nung isang audience member, lalong nawala boses ko." Produced by Dreamstar Events, Kyla's Flying High concert will take place at the Kia Theater on November 20. Ticket prices are P4770 for VVIP, P3180 for VIP, P2650 for orchestra, P1950 for loge and P848 for balcony tickets. For inquiries, log on to www.ticketnet.com.ph or contact Tel. No. 911-5555.